We've gotta chat because there's been something I've wanted to get off my chest for a while. Remember the good old days when Alex posted 2 times a week? Yeah, I don't remember either because it was so long ago. As I'm entering my junior year of high school, I'm realizing that school isn't what I thought it was. I'll try my best not to complain too much about school in this post but no promises. "School" doesn't actually start for you until you get to high school. Now, again, this could all totally be wrong based on what level of schooling you are in now. In short, high school has been the bane of my existence. Every morning I wake up and think to myself: "Today I get to go through another day of learning things I most likely won't need in the future, passing out fake smiles, trying to be someone I'm not." It's true, I am my worst self when I am at school. To some of my real life school friends reading this, it might not seem so. But when I'm at school, I'm not who I want to be but who my classmates want me to be. So school... where does that leave time for blogging? The short answer to the above question is... it doesn't. School doesn't leave time for blogging, that's just the sad truth. I have to squeeze in time before I go to sleep and on the weekends just to get these posts out and flowing. And nobody's kidding themselves, I haven't been posting consistently for the past 6 months. I'm not even going to lie about it lol. It's one thing if I didn't post for months on end but it's a totally different thing when I just don't post consistently. I tried doing a once-a-week kind of thing, but then 7 days turned to 8 days and 8 days turned to 10 days. I couldn't keep up with my own set schedule, and that was the most disappointing thing to acknowledge. Then I noticed that the quality of my posts were going down. It went from long discussion posts to short lists just rambling on and off about a certain book. That's just not the content I want to be creating. I started this blog in an effort to share my passion and personality. How are a few sentences and a list going to do that? 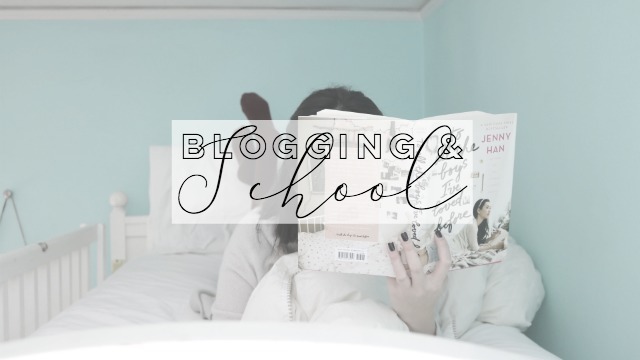 I really don't want to keep talking about the many ways in which school has ruined my blogging life but instead, I want to impart some beneficial advice to many of you struggling bloggers and readers out there. I've seen one too many bloggers stop blogging all because school got in the way. It really hurt to think that one day that could be me because school just keeps getting harder and harder. I don't want that to happen to anybody. Go through with your passion, write blog posts, share your favorite reads, but don't ever let school get in the way of any of it. If school is taking you away from doing what you love, that's a problem (in my opinion). Sure school is important and it's what you should be focusing on, but don't feel miserable at it. A lot of people always ask me how I handle being a book blogger, booktuber and bookstagrammer, while being a busy high school student. I never really thought of it but hell yeah I do do all that! I thought to myself: "maybe I really do have some things to share." Although these tips may not be anything unique or ground-breaking, they are few simple things I do in order to stay sane while creating content. From fellow student to student, here are my tips for blogging through the school year! 1. Leave those weekends open! Like I stated above, I mostly blog on the weekends. That also goes for booktubing and bookstagramming. I write blog posts, edit and film videos and take pictures for Bookstagram all on the weekends. Considering that my weekends aren't all that laid back and chill, I think this is something anyone can do. On the weekends, you are also a little bit more flexible with your sleeping times. Because you can stay up later, you can also just sit on your bed and write those blog posts for an hour or two straight (like me right now hehe). Weekends are imperative, so even if you want to be lazy and do it on Sunday take the initiative and tell yourself that it must be done NOW. I never said I was a good influence. Whenever I'm in any of my boring classes (APUSH *coughs* APUSH), I like to take out my little moleskin and jot down any video ideas or blog posts ideas. That way, by the time I'm ready to draft a post or film a video, I already have everything I need to say drafted out on a piece of paper. Trust me, it's going to work okay! I'll attach a little snippet of some of the things that I write in my notebook for videos. 3. Watch other creators and constantly read other's content. Most, if not all, of my content ideas are obtained from other blogs and other booktube channels. I get inspired by the people around me and, of course, I give credit where credit is due. Sometimes when I watch something that my favorite blogger has come up with, I am inspired to create something similar. It's really easy to be inspired by the thousands of blog posts that are published every day by creators just like yourself, so don't hesitate to use the resources at your disposal.